Teaching English abroad is a great opportunity in many ways. If you’re an aspiring teacher it is invaluable experience that will shine brightly on your resume for future job prospects. It’s also a great way to travel while working. A win-win situation. You’re getting paid to work in a country that you’ve always wanted to visit. Teaching contracts are generally one year (sometimes two) and that allows you plenty of time to see all that you want to see where you otherwise wouldn’t be able to if you were just going on vacation. For those who are coming out of college to embark on a journey of this kind – it’s a nice transition from college and there isn’t a whole lot you have to lose. You’re still free of stresses that will hunt you down later in life. Carefree enough where jumping on a plane headed for another country is not all that scary. At least not as scary as it would be for someone with a mortgage, car payment, and who knows what other debts to pay. However, if you’re reading this and you’ve been out of college for a while (long enough to pile on gobs of bills and debt) then leaving for a year to live in another country is more foreign of an idea than the country itself. You have a career whether it’s enjoyable or not, and leaving it is huge decision. I know. I was there. I was neck deep in a 15 year “career” I dare say in the IT industry. I was a technical writer (aka business analyst) and project manager in software development. It is a fantastic career. For me it was until 2008 when the economy decided to take a vacation of it’s own. The country was turned on it’s head and countless people lost their shirts. I was nearly one of them. I was stuck in a rut trying to grab any contract I could get my hands on to continue my career. But that’s me. Enough about me – let’s talk about you! Have you been in my shoes with your career? Are you there now? Have you ever considered taking a year off to explore the world? Do life in another country. Just to get away for a while even. Maybe you really enjoy your career but still would like to go somewhere. You may have commitments that you can’t just drop, but maybe they can be managed for a year or two while you’re away. So how do you quit your job to do something like teaching abroad…without regrets? I think it all starts with asking yourself real questions. Like, what is life about? Why am I so intent on keeping on this path? Does this job bring me down more than I can bring myself back up? There are many questions, but you have to ask them to yourself whatever they are. Those you wrestle with from time to time. Traveling abroad and teaching English for a year or so is a very short term endeavor if you look at it in the broad scheme of things. It can only help you grow as a person and open your mind to new ideas. I can’t tell you what those ideas will be for YOU, and you won’t know what they are either until you’re there. You have to decide. Beware of “analysis paralysis” as I was once told. If it’s itching, maybe it’s time to scratch it. Just go for it. Unloading a bunch of unnecessary stuff and throwing the rest in storage only seems daunting when you haven’t committed in your mind. Then you have to DO. Can you quit your job and teach abroad? I don’t think it’s a question of “if” you can do it as much as it is a question of “when” you will. Regrets will likely be the last thing on your mind. Ponder, decide, take massive action! They say it’s your birthday…! A job, a career…they are temporary like our lives. It’s entirely possible to reinvent yourself and see life in a completely different way. If you get there, you won’t know regrets. Even if it’s short term, you’ll be glad you did it. Switching gears and venturing down a new path isn’t something that everyone has the ability to do and that’s reason enough to consider it. I’ve been teaching English in South Korea for two years come August and at the moment it’s an impossibility to return to the IT industry. I’ve gained new strength and have embraced this new life. I’m doing what is within my power to continue down this path (e.g. teaching certifications). It makes sense to me now and the frustrations I once had are now gone. I am that thing now. The fantasy I would ponder over while sipping my morning coffee before heading off to “project manage” something. There are so many countries to see and so many more blogs to write about my times in those places. It would be foolish to go back now. One of my favorite bands in college (a looong time ago) was Blues Traveler. They had a song called “100 Years”. The chorus went, “…and it won’t mean a thing in a hundred years”. The irony of that chorus is that it’s completely true. Wow, a really great article Tom. I'm sure many others will be inspired to make the change soon. Can't wait to embark on on my own adventure to Korea (which begins in a few months). I haven't thought about the martial arts part though, maybe I could give it a go! A truly inspiring article and it basically echoes a lot of thoughts I've been having over the last few years. I'm a German high school teacher (I teach English, French and philosophy) and I do like teaching, but I would love going abroad to experience other cultures and also martial arts. 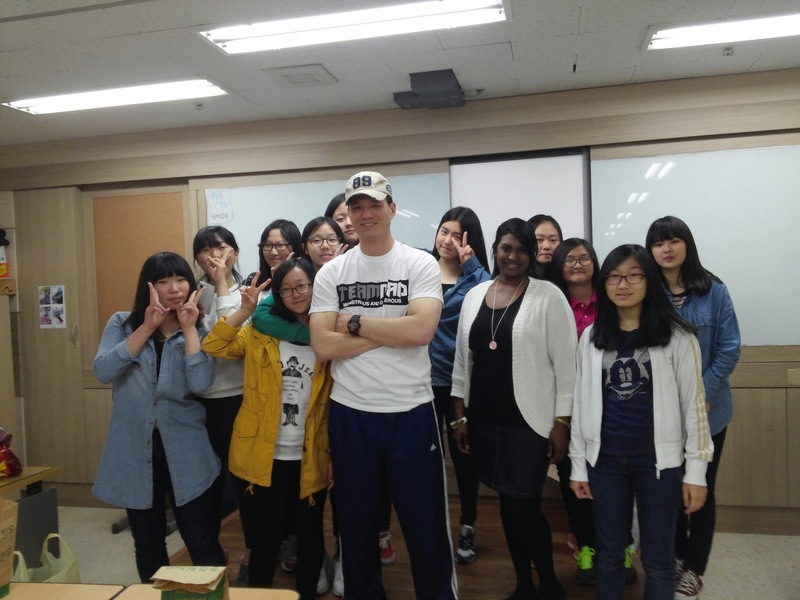 I have already taught in the US, France and Japan and I'd be really interested in South Korea, too. The only problem is that if you're not a native speaker of English, it's so much harder to find English teaching jobs and German and French teaching jobs are always a lot rarer. Anyway, I may still try it and it's always a pleasure to read inspiring articles like yours. That's great to hear about coming to Korea. Make the most of it and go away with good memories. Give martial arts a try! Hey Tom…. What do you think about Krav Maga 🙂 ha ha. I take it currently and am having a blast. I’ve always heard good things about it. For self-defense and police/military work it’ll be much more effective than, say, MMA or BJJ type of stuff. Depends on what you’re looking for. Keep at it! Sounds like you've already done so much. Maybe you could teach German in another country?? I know a French teacher here who's been in Korea for maybe 15 years now. Thank you for the encouraging words too! 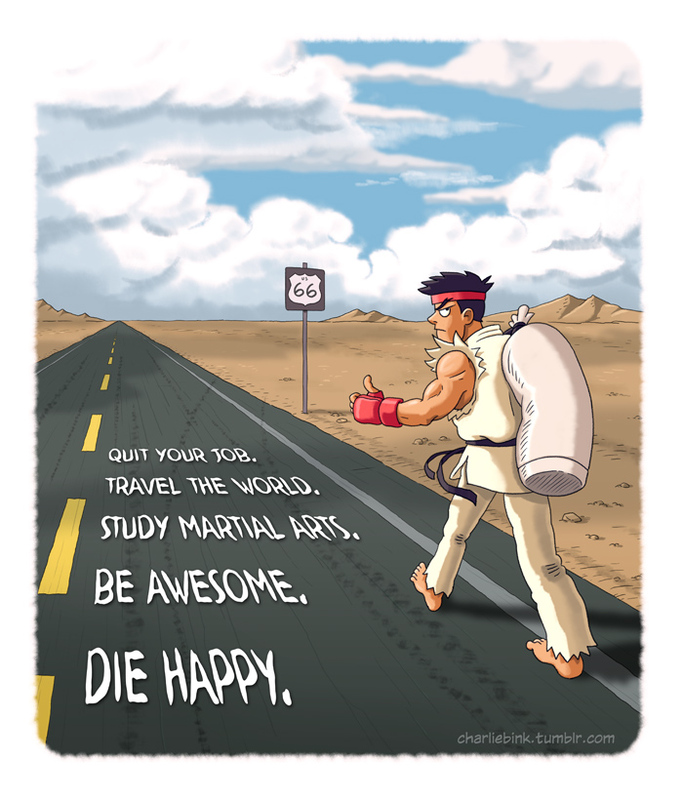 I enjoyed the article and the last picture with Ryu gave me a chuckle. Did you have to give a self introduction on stage during the Epik orientation ( Just curious, as I am not always the best at those)? Not a self-introduction, but you will likely need to do a mock class with a small group in front of the rest of the class. Don't stress too much. It's all fun in the end. True, I have to keep that in mind. Thanks Tom! I wrote you an email on this subject before I read this! You…have just described the last 7 years of my life. I like my major and don’t really see myself doing anything else, but most of the time I feel the same way as you did. Slightly unfulfilled . Foreign languages, cultures and even theater interest me but I’ve always considered them hobbies. Wow. I will definitely do this. Who knows, maybe I’ll find the answer I’m looking for. Thank you Tom. Thanks so much for commenting. I think a lot of people, most…maybe everyone has these feelings at one point or another. But some more than others. When someone gets stuck in a rut doing something they just don’t enjoy, it can be a tough road to navigate. All the best with your career and finding the things that you’re looking for. 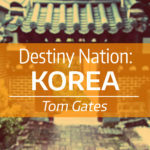 Hey Tom, I’m a big fan of your YouTube channel and blog and I just wanted to thank you for going through the trouble of making and maintaining this website to document your experiences, thoughts, and growth on your wild journey from IT guy to being an English teacher in Korea. I love the graphic you included at the bottom of this entry, about your mantra. It resonates with me and it is a lifelong goal for me to practice martial arts and travel the world, engaging in different languages and cultures. I am currently practicing Tae Kwon Do, and my wife is still a Korean citizen (actually she is from Busan!) so Korean martial arts have a special place in my heart. 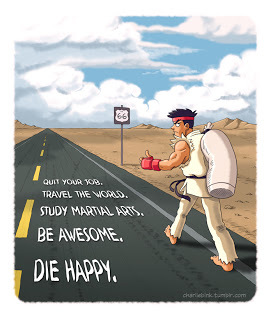 I often tell my wife that I would love to go and live in Korea and just do Tae Kwon Do all day, every day! Ha ha. After I attain a certain mastery of Tae Kwon Do, I very much will want to begin learning other arts, too, like Judo and Hapkido. I hope one day if my wife and I come visit Korea we can meet you! As I’m writing this I’m listening to that song you quoted by Blues Traveler. It’s the first time I’ve heard it, but the chorus definitely resonates with me as gospel truth. Sometimes it is so easy for us to get overly caught up in the rat race that is the competition for survival, prestige, money, and status that we lose sight of what is of lasting importance and how to be true to ourselves. We can work 100+ hours a week slaving away to work our way up the ladder so we can get that BMW, but like the chorus says, “it won’t mean a thing in 100 years.” So why not adjust your lifestyle in a way that brings you happiness? Ha ha. Sorry, just freely thinking and typing here. Your blog entries often make me reflect upon my own life and how I can be true to myself to balance the practical with the things I really love doing, and when possible, finding a way to combine the two. I’m sure the exact formula for that is different for everybody! Sorry for the long post! Keep us updated with all your adventures! What a small world that your wife is from Busan. I think you should definitely take the opportunity to visit her home country and take some of it in for yourself. It would mean a lot to the both of you. Korea definitely has a different approach to martial arts than in America. It’s not mystical or “zen” or anything like that, but it is treated differently. The mindset is different, and it’s more integrated into people’s lives compared to back home. I think you’d enjoy it. I don’t know if you’d like coming to train at a local dojang, but maybe if you could get into some international courses at a university, you could train in with the taekwondo team. That would be memorable. So many colleges have martial arts programs like TKD, judo and gumdo (kendo). Whatever route you take, have fun with the journey! I’m a fan of your youtube channel which has led me here! I have to say this article speaks to me and what I am experiencing now. My answer to “Why am I so intent on keeping this path?” is fear, plain and simple. I’m afraid of giving up my “secure” job for the unknown. It’s taken me a while to allow myself to be okay with the idea of not knowing what happens next (I’m so used to planning my future for the next 10 years, which doesn’t pan out because life happens! lol). So, I am making myself comfortable with my plan of teaching English in Korea for a year, hopefully two, and seeing how that goes. One of my dreams is to live and work in a foreign country and when I see other people doing just that, it’s inspiring! Thank you for your videos and your blog! I completely understand your mindset. I was the same way. I suppose I still am to a certain degree. It was incredibly difficult for me to make the leap. Honestly, if it wasn’t for the bad economy ripping me from my comfort zone, I probably would never have come. But it all worked out and I sold nearly all my stuff and have reduced everything down to a 5×5 storage unit. I still have my condo, but otherwise, all is just stuff. And it’s gone. There are so many countries and opportunities out there. You can do Korea, and then maybe other countries. It’s not a bed of roses – it’s life. But it’s an intriguing one and it will change you forever. Good luck. I really think you should write a blog on why you still have your condo. I’m in a TESOL certificate program, and really struggling with the thought of liquidating EVERYTHING. Thank you. Initially I tried to unload my condo, but decided against it and I’m glad I did. At a minimum it will be a retirement investment someday. That’s why I went ahead and kept it. Most other things I unloaded and now my belongings fit into a 5×5 storage unit. I studied Martial Arts and am/was an IT professional like yourself. I got my CELTA (man that was a long time ago!) quit my Job and went to Korea to teach way back for several years. Then I had a nasty string of unfortunate events with a couple of Hagwons. (The main 2 were great!). I returned home and got stuck back into IT. It used to be good money and rewarding, not so much anymore. Now, having been laid off, and looking back over the past couple of years, I’m looking at coming back to Korea. When I was in Korea last I taught Maths, Video Game Programming and TaeKwonDo in English as well as English itself, of course. The kids came a long way in a very short time. I worked for a ‘Multigwon’ and my boss said I could teach them what I wanted so long as they learn English! It was very rewarding. I really don’t know why I left, just felt I was too ‘old’ and needed to settle down (Early 30s!) Now , I think, wth, If I went back I could easily teach and have enough spare time and money to do online courses that I enjoy as well as get back into TaeKwonDo. I really miss my life there and want to get back ASAP. Go Figure! Hind sight is 20/20, my friend. For those very reasons I believe it was better for me have come to Korea now, later in age, than when I initially planned back in the day. If you have your CELTA, you should try to get back into EPIK or GEPIK. They favor applicants with experience and certificates like CELTA and TESOL. Ironically, I’m about to upload a video that will accompany this very blog post. So check my Youtube channel in the next day or so for it. All the best! Hey there! I think we’re kindred spirits. 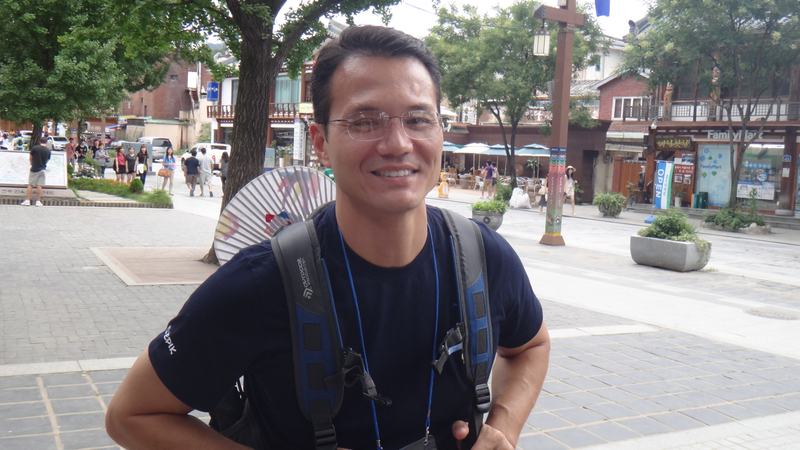 I too have been in the IT field for about 15 years and have contemplated taking a year off to teach English in Seoul. However, the thought of giving up my cushy salary that I worked so hard to make, gives me the willies. So, while I do love Seoul and travel there for vacation every year, I am planning to go to Europe instead and get my Masters in Cyber Security, spending a month in Seoul during the summers and working on my Korean. I love the people and culture, and that’s why I want to live there, not so much to escape my life (although my co-workers are driving me to that point, hence becoming a full time student in northern Europe. OK, OK, so I’m escaping from my life). But, kudos to you for having the courage to leave it all behind. Actually, I had trouble finding stable work in IT too when I lived in Atlanta. However, moving to Washington, DC proved to be a smart move. So, if you ever decide to come back home and join the daily grind, consider DC. With your experience, you can make anywhere from 80K+, and since a lot of these companies are Global, it is possible to transfer anywhere you want in the world (the cost of living in DC is high), and have a nice US salary to enjoy as well. That’s what I am shooting for anyway. Happy, low stress and paid well. It’s possible, no? I’m still applying to schools but if that plan doesn’t work out for whatever reason, maybe I’ll see you in Seoul in September! Haha. BTW, if you have never been to Samdae Bulgogi Noodles near Insadong, give them a try, because they have the best Bulgogi Bibimbap on the planet. Seriously, I though I’d died and gone to heaven. Totally awesome. Hey, bud. Thanks for writing and sharing. I have to say, if you enjoy the job/career and have the opportunities to travel as you do, I’d say stay with it. That over going to teach English, that is. But to go to Europe to study is a definite no-brainer to me. GO! Every so often I wonder if I should venture back into the old career. But the itch is usually a passing moment as I remember the days sitting in cubes and meeting rooms and the nonsense to get things done. Not to mention not feeling any fulfillment in the work. That’s completely me though. Some people thrive off of it. To each their own. My hope is to move on from Korea some day and try to snag some of the higher profile teaching opportunities to save a bit more money. It’s a simple life free from piles of bills. It all comes out in the wash. For now, it’s all I could imagine doing. Maybe in the future I’ll change my mind. Of course, maybe by then it’ll be too late to go back! Which may answer all my questions about returning to IT. All the best to you. Keep me posted! Well put Tom. Your experiences seem similar to mine, except I left a three-job a week life to pay off a pile of student loans in Boston to come to Taiwan and study Wing Chun kung fu from a the nephew of IP Man, while teaching English. Can’t say I could ever regret that! I think you’re the type of person who’d appreciate this kind of story. I’ll be posting some more soon of my kung fu experiences and other adventures, as well. That was an awesome story. I love the McDonald’s story most. Nice move going up to a closed off floor to catch some Zs. I like it. Do you have your own blog? I think Taiwan would be a great place to live and teach for a year or two. Sounds like it’s home for you now. Hey Tom, do you have plans to find a wifey and start a family some day? I’d like to hope so. It would be tough at this moment since so many things are up in the air, but you never know. Thanks for the writing this! I completely understand the statement “analysis paralysis”. I have been experiencing the internal debate about teaching overseas for a few years now. I have a great job teaching here and a condo which make things more difficult but not impossible! I am looking at taking a TESOL class right now and have noticed all the options! Are there certain criteria that I should look for? Otherwise, I will get the groupon deal for $70 as opposed to the $1100 I should pay at the local college. As long as you shoot for the 120 hour course you should be ok. One’s that require in-class practicum are even better though, but it’s up to you. When the time is right for you, give me a shout and I’ll put you in touch with my recruiting associate to give you some options, both public and private. Are there are kind of age limits when it comes to teaching? I’m 44 and have started to really consider teaching English in Korea. I’ve been in the IT industry (programmer mostly) for about a little over 15 years and, while it’s been to me for the most part, I don’t find it very fulfilling. I think living abroad and teaching would be an awesome experience! It really depends on the situation. It’s no different than other industries. Generally the cut off starts in the mid to late 50s. That said, if someone has 30 years of experience, they will still be a commodity for some schools abroad. Teaching abroad is a great experience. I would recommend getting a TESOL certificate and also be open to other countries. China, for example, will have countless opportunities and your age will be less of a factor. I’ve always been interested in teaching english abroad, but I have heard mixed things about it. After reading your post I feel a lot more comfortable about making the leap. Much of it comes down to what you make of it. When you get to the point of getting a job, just approach with caution. Ask for references if possible. If you go with EPIK, you’ll be fine.